In a three earlier posts I mentioned that my dad spent his career at General Motors. ("My Dad, General Motors & Me" Part 1, Part 2, Part 3) When I wrote those posts back in December no one was sure what GM's future held. It appears now that GM will file for Chapter 11 bankruptcy. GM screwed up in many, many ways. There's no doubt about that. I have my theories as to what their biggest screw ups were, but really, what do I know? They'll be plenty of people, all with a lot more knowledge than me, writing about that for years to come. The hope is that GM emerges from Chapter 11 a "leaner and meaner" company. Looking at some of their recent concept cars, I'm not so sure that will happen. "Leaner and lamer" seems to be a greater possibility. I haven't desired a GM car in a very, very long time, but I am who I am in part because of my dad and his affiliation with GM. I won't repeat what I wrote in those early posts, I'll just end this part of this post by saying that it's sad and painful to see this once great American icon, a company that had so much influence on me and my family, reduced to this. 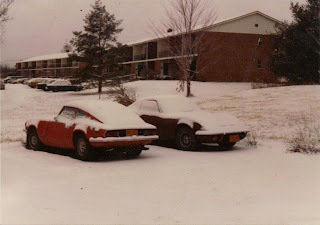 The man I bought my Opel GT from (the original owner) was a chemistry professor at SUNY Stony Brook. He apparently liked to take his work home with him. My first memory of the car is of vacuuming a million pieces of broken test tubes out of every place imaginable. That's not exactly what you want to be doing on the first day you own a car, but it had to be done and things only got better from there. The 1.9 liter engine (an unusual cam in head design) was durable and relatively powerful. 0 - 60 took just under 11 seconds, putting it in the same league as most 4 cylinder sports cars available in the US at the time. The suspension was pure Opel Kadette and handling could best be described as safe and adequate. The Opel GT was not the sportiest of sports cars you could buy in the late sixties and early seventies, but it was an interesting alternative to an MGB GT or Fiat 124 Coupe. It remains that today. 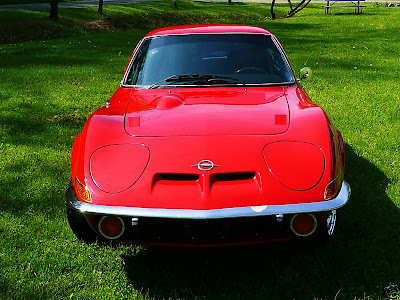 Located in Knoxville, TN, click here to see the eBay listing for this 1973 Opel GT. You're so right. Chrome wheels are a mess on ANY car. ANY CAR!